Another great iPad app from Korg - you'll have hours of fun with it. A great synth. Good modulation options. Drum machine and sequencer make it an all-in-one production environment. Might be a bit too intimidating for newcomers. 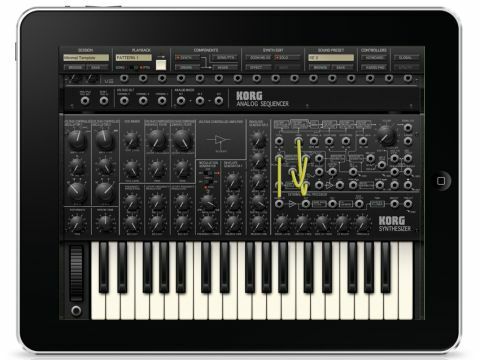 For its second App Store entry, Korg has not only virtualised its legendary MS-20 analogue synth, it's coupled it with a recreation of the accompanying SQ-10 16-step sequencer, and then taken things another step further with a six-part drum machine, seven-channel mixer and built-in effects processing. The MS-20 monosynth is the star of the show. You get a pair of oscillators, three and five-stage envelope generators, LFO, VCA and, of course, those gloriously squelchy MS-20 filters. Noise and ring mod are included, and the LFO can be synchronised to the sequencer. Speaking of modulation, iMS-20 includes a proper patchbay complete with virtual patch cables. Not that you need them, because just like a real MS-20, iMS-20 works as a fixed-signal path instrument when no cables are jacked in. Further control is provided via a virtual keyboard and a pair of Kaoss pads, one of which can be made to trigger notes in a selected scale, while the other is a fun way to tweak synth parameters. The 16-step sequencer sits atop the synth and can be dragged down with your finger. There are three rows of 16 steps and a row of trigger outputs. The sequencer can control volume, pitch and pan, or pump out a generic control signal. The drum machine section provides six-part rhythm sequencing with each sound created from a dedicated MS-20. You can control notes, volume and pan via the sequencer knobs. It's fast, friendly and flexible. Sequencer patterns can be arranged into songs and dumped via iTunes, and there's even built-in SoundCloud support. The iMS_20 is a superb-sounding app, andone that invites hours of tweaking. The patchbay might be a bit intimidating to raw recruits, but the seasoned vet will appreciate the familiar playing field. Note that the price rockets up to £19.99 from February onwards, so grab it at the introductory price while you can!